Who are they and how can they help you? • Speech and language therapists who help you with your everyday conversations and any difficulties you have with swallowing food and fluids. It is best to make early contact with an AHP if you are worried about your memory or if you or someone in your family has recently been diagnosed with dementia. That way you can get the information, advice and treatment that is right for you and your family as quickly as possible. Our leaflet describes how AHP’s can help and how to get in touch with them. • email us at TalkingDementia@Alzscot.org and we will send you a copy. Thank you for reading this blog. We look forward to hearing your views and ideas on our allied health professional leaflet and this blog? My remit in Alzheimer Scotland is to bring the skills of AHPs to the forefront of dementia practice and to share with them the principles and practice of working in a major charity that is dedicated to “making sure nobody faces dementia alone”. I am leading the delivery of commitment 4 of Scotland’s Dementia Strategy. In short, a great job working with great people. Communication and eating, drinking and swallowing are fundamental to our well-being, and it is the speech and language therapist’s role to help with these skills for people with dementia at all stages of the illness. The following questions highlight many common areas of difficulty and I hope that the answers provide people with ideas on how to work around the challenges. 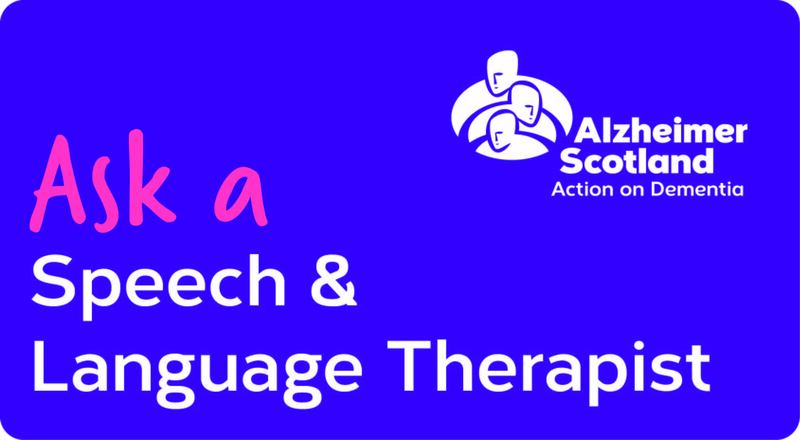 Question 1 – Do speech and language therapists work with people to learn to sign some words when speech is going? Answer – This would be very unusual, unless the person had signed previously. It is recognised that it is generally difficult to learn new skills. However, increased use of body language and natural gesture is fully recommended. Most of us have highly developed skills at reading body language that we developed as babies and toddlers before we even started speaking. It is likely that the person with dementia is reading body language (which includes facial expression, tone of voice, posture etc.) long after language comprehension has deteriorated. It is therefore important to be aware of what you are communicating non verbally and to enhance natural gesture to facilitate comprehension. The person with dementia can also be encouraged to increase their use of gesture to aid their expression when words are difficult to find. Playing miming games such as charades may be a way of encouraging this skill. Question 2 –My wife has difficulty with her speech. She gets very confused and often uses words that make no sense. She then gets angry with me when I don’t understand what she wants and sometimes throws things at me. I am weary and at times quite frightened. I have no idea how to help her tell me what she wants. Answer – this is a difficult one. It is obviously important to reduce frustration because more effective communication is always achieved in calmer settings. Firstly, always ensure that distractors such as television, radios, barking dogs, crying grandchildren etc., etc. are reduced to an absolute minimum. One to one communication is always more likely to be effective. Alternatively pick up objects, pictures and say ‘is it this?’ Visual materials help to focus the person and helps them to remember what it is they are trying to talk about. As in the previous answer, encourage the use of gesture to get messages across. However, if all this increases frustration and inevitably sometimes this might happen, it is vital to acknowledge that frustration and suggest she comes back to it later. Then try to distract her with another activity or topic. Question 3 – My wife gets very frustrated when she can’t find words. Should I finish her sentences for her? Answer – Finishing sentences for people depends very much on individual relationships and there isn’t one stock answer. I recommend that you ask the person whether they would like support on completing sentences and how soon you should ‘jump in’. Be aware that you need to be listening very carefully to be sure that the word you offer is actually what the person is trying to say, because selecting the wrong word can increase frustration. Question 4 – I am finding my friends have stopped visiting because it is so hard to have a conversation. Is there anything you can suggest which might help? Answer- It can often be daunting for friends to continue visiting if they feel conversation is becoming more difficult; however there are several ways that good interactions can still be achieved. Generally speaking, it is better to focus conversation on a tangible object such as a newspaper, photograph, keepsake or newly acquired item from the shops, for example. 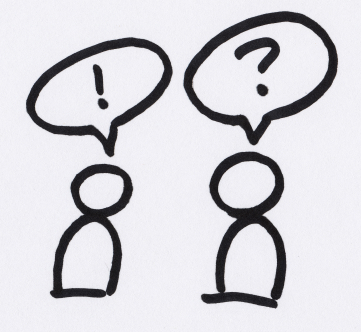 This is because 1) the focus is taken off the person and put on to the item and 2) the person is more able to keep in mind what the topic of conversation is. Old photographs are particularly good as very often older memories remain for longer. Remember though that it is not necessary to correct erroneously remembered memories because the focus should be on the quality of the shared interaction and not the truth as you remember it. Sometimes people find conversation flows more easily if you are both involved in an activity together e.g. arranging flowers, tidying out a drawer etc. Simply commenting on things such as ‘that is a beautiful flower’ or ‘I had a pen like this once’ may well result in an exchange of comments. It is important to avoid the use of questions, particularly open-ended ones such as ‘What did you do in the war?’ Even questions that just require a Yes/No response often don’t lead to further conversation easily and should be used as little as possible. It is also important not to talk too much. Often we fear silence and try to compensate for the reduced conversation from the person with dementia by talking incessantly. Occasional comments and companiable silence, particularly when engaging in some activity is absolutely fine. Question 5 – My husband has been put on a soft diet and really misses his favourites. Is it ok to bend the rules a bit? 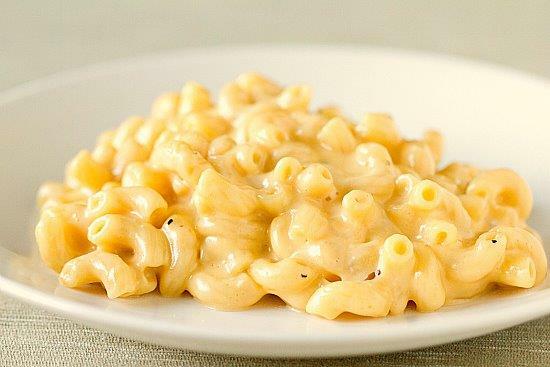 Answer- There are many different reasons why people are put on a soft (puree diet). It would be very important to discuss with the Speech and Language therapist (SLT) why he was put on this dietary texture in the first place before bending the rules. Modified diets are used to reduce risk of choking and/ or aspiration of food and drink that might lead to chest infections, and it is vital that the level of risk for your husband is fully understood. SLT’s are always mindful of balancing the risks against quality of life. It is often found that people manage their favourite foods better due to increased stimulation and therefore an informed discussion with your therapist could result in a controlled trial of these foods. We welcome ideas and comments from our readers about this blog. I work in East and Midlothian Psychiatry of Old Age teams seeing people with communication and/ or swallowing problems from the point of diagnosis of Dementia, and at any stage throughout the patient journey as the need arises. What self-care information from this group of professionals (outlined above) would be helpful for you to live well with dementia that we can post in Let’s Talk about Dementia? What other work and roles would you like to hear about that we are leading on in Alzheimer Scotland? 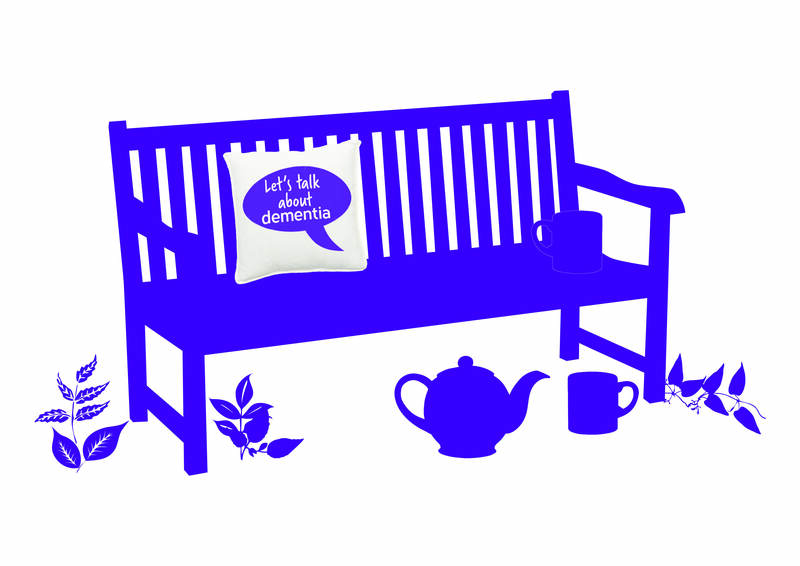 What other new work do you know about in the area of dementia care would you like us to include in our weekly blog posts?